Jesus has been described as the best known figure in history, and also the least known. If you mentioned the name 'Jesus' and someone asked Jesus who?, you might blink. Or laugh. Even people who don’t think Jesus was God, mostly believe they know a fair bit about him. You might be surprised that some of your most basic assumptions about Jesus are probably wrong. We have no record of anything that was written about Jesus by eyewitnesses or other contemporaries during the time he would have lived or for decades thereafter, and as best scientists can tell, all physical relics of his life are later fakes. Nonetheless, based on archeological digs and artifacts, ancient texts and art, linguistic patterns, and even forensic science, we know a good deal about the time and culture in which the New Testament is set. This evidence points to some startling conclusions about who Jesus likely was—and wasn’t. Cropped hair, not long. 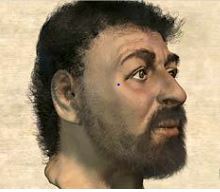 Jewish men at the time of Christ did not typically wear their hair long. A Roman triumphal arch of the time period depicts Jewish slaves with short hair. In the Apostle Paul’s first letter to the Corinthians, he addresses male hair length. “Does not nature itself teach you that if a man wears long hair, it is degrading to him?” (1 Corinthians 11:14 NRSV). During the 1960’s conservative Christians quoted this verse to express their disgust against the hippy movement and to label it as anti-Christian. Hung on a pole, not necessarily a cross. For centuries scholars have known that the Greek New Testament word “stauros,” which gets translated into English as cross, can refer to a device of several shapes, commonly a single upright pole, “torture stake” or even tree. The Romans did not have a standard way of crucifying prisoners, and Josephus tells us that during the siege of Jerusalem soldiers nailed or tied their victims in a variety of positions. Early Christians may have centered in on the vertical pole with a crossbeam because it echoed the Egyptian ankh, a symbol of life, or simply because it was more artistically and symbolically distinctive than the alternatives. Imagine millions of people wearing a golden pole on a chain around their necks. That Jesus is typically depicted taller derives from the mental challenge people have in distinguishing physical stature from other kinds of stature. Short, not tall. The typical Jewish man at the time of the Roman Empire was just over five feet tall, which makes this a best guess for the height of Jesus. That he is typically depicted taller derives from the mental challenge people have in distinguishing physical stature from other kinds of stature. Great men are called “big men” and “larger than life.” In ancient times they often were assigned divine parentage and miraculous births, and the idea that Jesus was uniquely divine has created a strong pull over time to depict him as taller than is likely. A good illustration of this is the Shroud of Turin, which is just one of many such Jesus-shrouds that circulated during medieval times and which bears the (now reproduced) image of a man closer to six feet in height. Born in a house, not the stable of an inn. The miraculous birth story of Jesus is a late, maybe 2nd century addition to the Bible, and consequently it contains many fascinating mythic elements and peculiarities. But the idea that Jesus was born in a stable got added to the Christmas story even later. In the original narrative, Joseph and Mary probably would have stayed with relatives, and the phrase “no room for them in the inn (gr: kataluma)” is better translated “no room for them in the upper room.” Later storytellers did not understand that people of the time might bring animals into their ground floor, as in Swiss housebarns, and they assumed that the presence of a manger implied a stable. Named Joshua, not Jesus. The name Joshua (in Hebrew Y'hoshuʿa meaning “deliverance” or “salvation”), was common among Jews in the Ancient Near East as it is today. Joshua and Jesus are the same name, but are translated differently in our modern Bible to distinguish Jesus from the Joshua of the Old Testament, who leads the Hebrew people to the Promised Land. In actuality, though, the relationship between the two figures is fascinating and important. Some scholars believe that the New Testament gospels are mostly updated retellings of the more ancient Joshua story, remixed with episodes from stories of Elisha and Elijah and Moses. A modern parallel can be found in the way that Hollywood writers have reworked Shakespearean tropes and plot elements into dozens of modern movies (though for a very different purpose). Number of apostles (12) from astrology, not history. Whether Jesus had 12 disciples who ranked above his other devotees is an open question, as their names vary from list to list. Since the Gospels echo the story of Joshua, the "12" apostles most immediately mirror the 12 tribes of Israel. But the number 12 was considered auspicious by many ancient people, including the Israelites, and the 189 repetitions of the number 12 in the Bible ultimately may derive from the same pre-historical roots as the 12 signs of the zodiac and 12 months of the year. Astrotheology or star worship preceded the Hebrew religion, and shaped both the Bible and Western religions more broadly. One might point to the 12 Olympian gods or 12 sons of Odin, or the 12 days of Christmas or 12 “legitimate” successors to the prophet Mohammed. Prophecies recalled, not foretold. Even people who aren’t too sure about the divinity of Jesus sometimes think that the way he fulfilled prophecies was a bit spooky, like the writings of Nostradamus. In reality, Scooby Doo could solve this one in a single episode with four pieces of information: First, Old Testament prophecies were well known to 1st century Jews, and a messianic figure who wanted to fulfill some of these prophecies could simply do so. For example, in the book of Matthew, Jesus seeks a donkey to ride into Jerusalem “that it might be fulfilled which was spoken by the prophet” (Matthew 21:4). Second, “gospels” are a genre of devotional literature rather than objective histories, which means that the authors had every reason to shape their stories around earlier predictions. Third, scholars now believe that some Bible texts once thought to be prophecies (for example in the Book of Revelation) actually relate to events that were past or current at the time of writing. Finally, a psychological phenomenon known as the "Barnum Effect" ensures that those who want to believe in prophecies (or astrology, for that matter) will find amazing coincidences if they look hard enough. Some Jesus quotes not from Jesus, others uncertain. Lists of favorite Jesus sayings abound online. Some of the most popular are the Beatitudes (Blessed are the meek, etc.) or the story of the woman caught in adultery (Let he who is without sin cast the first stone) or the Golden Rule (Do unto others as you would have them do unto you, which, we are told, sums up the Law and the Prophets.) Which words actually from Jesus? This question has been debated fiercely by everyone from 3rd century Catholic Councils to the 20th Century Jesus Seminar. Even Thomas Jefferson weighed in, but much remains unclear. The New Testament Gospels were written long after Jesus would have died, and no technology existed with which to record his teachings in real time, unless a he wrote them down himself, which he didn’t. We can be confident that at least some of the wise and timeless words and catchy proverbs attributed to Jesus are actually from earlier or later thinkers. For example, the Golden Rule was articulated before the time of Christ by the Rabbi Hillel the Elder, who similarly said it was the “whole Torah.” By contrast, the much loved story of the woman caught in adultery doesn’t appear in manuscripts until the 4th century. Attributing words (or whole texts) to a famous person was common in the Ancient Near East, because it gave those words extra weight. Small wonder, then, that so many genuinely valuable insights ended up, in one way or another, paired with the name of Jesus. The person of Jesus, if indeed there was a single historical rabbi at the root of our traditions, is shrouded in the fog of history leaving us only with a set of hunches and traditions that far too often get treated as knowledge. The “facts” I have listed here are largely trivial; it doesn’t really matter whether Jesus was tall or short, or how he cut his hair. But it does matter, tremendously, that “facts” people claim to know about how Jesus saw himself, and God and humanity are equally tenuous. In the words of Mark Twain: It ain’t what you don’t know that gets you into trouble. It’s what you know for sure that just ain’t so. The teachings attributed to Jesus mix enduring spiritual and moral insights with irrelevancies and Judaica and bits of Iron Age culture, some of which are truly awful. That leaves each of us, from the privileged vantage of the 21st century, with both a right and a responsibility to consider the evidence and make our own best guesses about what is real and how we should then live. A good starting place might be a little more recognition that we don’t know nearly as much as we’d like to think, and a lot of what we know for sure is probably wrong. The Christian God's Obsession with...Blood? I am not a "True Christian"